Despite the fact that so much of the work we do is on computers, there still seems to be an amazing amount of paper used on a daily basis. Notes, faxes, bills, marketing mailings and more are all commonplace in every business. Yet, finding solutions that allow you to go paper-free may seem time-consuming. Luckily with one very affordable addition to your business, you can drastically decrease your scattered paper notes without a worry about not being able to find what you are looking for. Halloo’s cloud-based phone system lets you work greener and more efficiently than ever before. Tracking sales leads and keeping detailed notes while lead nurturing is an important part of sales. A tool like Halloo’s phone system lets you do so easily and instantly while you have the potential customer on the line. When you or another member of your team needs to follow-up with that information, it is instantly available to them, because it is stored in the cloud and is accessible by all users. Traditional fax machines indiscriminately print absolutely everything that is sent to them, including marketing messages, spam and wrong numbers. Not only does it create wasted paper, it costs you money on expensive ink. When you have a dedicated toll-free phone line just for faxes with Halloo, they are automatically routed to your email for easy management. If a customer is already on the phone line, you have an audience that is ideal for your marketing purposes. When you can market to someone who is already interested in what you offer, conversion rates are much better. Using a phone system like Halloo allows you the opportunity to create your own on-hold messages so that no matter what you want to market more heavily, your phone system is doing it automatically. Change out the messages as often as you want so they are always seasonally appropriate. Plus, with notes available for the whole team to see, you can broadcast potential upsell opportunities or upcoming sales promotions. With a cloud-based phone system like Halloo, you never again have to miss a phone call. Simply forward your work phone to your cell phone or home number with the find-me or follow-me setting that you have built in. This eliminates missed calls and confusing handwritten messages. Gone are the rolodexes and other booklets previously kept to maintain contact information for sales leads and actual clients. With a virtual phone system, you have the ideal solution for storing all the contact information you need so that no matter where you are, you can have practically instant access to the information simply by signing on to your user account – all because the information is stored in the cloud. 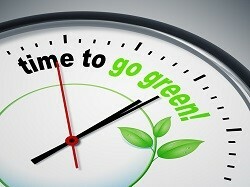 Taking the time to make subtle shifts in your business can lead to a much greener enterprise. One simple tool, like Halloo, can lead to less waste and contribute to a leaner, cleaner existence. This entry was posted in Cloud Phone System, Marketing, Small Business by daniel. Bookmark the permalink.